Having been involved in athletics, particularly endurance running, since 1957 I have found that others involved in the sport are almost universally friendly, genuine and helpful. I had watched Vikki in training and racing for several years and admired her abilities when I invited her to help organise the women’s events in the major BMC Grand Prix meeting at Scotstoun at the turn of the century. She was happy to come to the committee meetings when she could, gave valuable advice and was a real asset to a male dominated committee. One of the most genuine and approachable international athletes that you could come across, she has suffered from a surprising lack of recognition domestically. It may be the price of being a talented runner at the same time as Liz McColgan and Yvonne Murray in Scotland, and Paula Radford and Liz Yelling in Britain. Of her talent, there is no doubt and Colin Youngson has written this profile of her athletics career. Vikki McPherson (born 1st of June 1971) achieved a great deal in her running career during the 1990s. She was a Scottish and British Universities champion, a Scottish title winner, and ran internationally for both Scotland and Great Britain, on track as well as cross country. In addition she won medals in World Universities competitions and in the World Cross Country Championship. Between 1989 and 1993 Vikki studied accountancy, and enjoyed playing a full part in the athletic and social life of her club, Glasgow University Hares & Hounds. She was a natural choice to be Treasurer and, of course, won a Blue. Previously, she had been a member of Troon Tortoises; and went on to compete for City of Glasgow AC. Fellow Harey Alastair Douglas writes “Vikki trained very hard under the guidance of Bill Parker. She was both organised and disciplined in her approach to training and was also happy to advise and encourage other runners. She was extremely friendly and popular within the sport.” This is obvious if the history of GUH&H is consulted. It makes clear not only that Vikki improved constantly as an athlete, but also that she competed in all the usual student races, including the Isle of Man Easter Running Festival, and was a lively, mischievous young woman who loved a party. There is frequent reference to the singing of certain student songs and the writing of satirical performance poetry. Vikki’s team-mates in a very successful outfit included Hayley Haining, Joanna Cliffe, Suzie Donaldson, Jan Roxburgh, Katrina Paton and Michelle Jeffrey. At the 1992 World Cross Country Championships in Boston, USA, Vikki McPherson had a fine run for GB in freezing conditions over a snow-covered course and finished 62nd. Then in the World Students CC Championships in Dijon, France, Vikki captained the British Women’s team to victory and secured an individual silver medal. (In 1994 she was also part of the winning team in this event when it took place in Limerick.) In May, Vikki won the Strathclyde Women’s Kelvin 10k race in 33.05, 38 seconds in front of fellow International athlete Sandra Branney. During her final year at Glasgow University, Vikki appeared less frequently for the students. However in December she won a Women’s Inter-District CC race in Irvine; and went on to represent Scotland in an International CC Race in Durham, along with Hayley Haining and Joanna Cliffe (the West District and Scottish Universities CC winner). This may well have been the contest that Alastair Douglas referred to when he wrote “one year in the televised Durham International Cross Country, the Hares & Hounds beat Kenya in the team race!” In 1993, Vikki McPherson retained her Scottish CC title at Callender Park, Falkirk, and after being third once again in the UKChampionship trial race, once again gained selection for the British team competing in the World Cross Country Championships in Amorebieta, Spain, where she improved her finishing position to 38th. 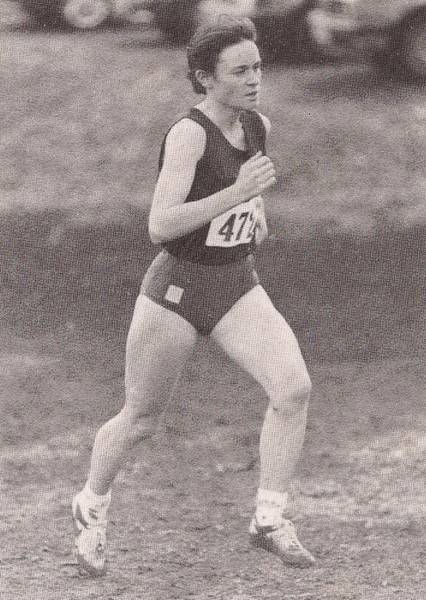 That summer, Vikki McPherson ran an excellent race when she finished fourth in the 1993 World Student Games 10,000m at Buffalo, USA, recording a lifetime best of 32.32.42 (which at the time was second only to Liz McColgan in the all-time Scottish ranking list). In addition she ran the 10,000m for Great Britain in the IAAF World Athletics Championships in Stuttgart. After leaving university, Vikki continued her successful athletics career, although she began to suffer from injury. She was fifth in the World CC trials and represented GB once more. Running for Scotland in the 1994 Commonwealth Games in Victoria, Canada, Yvonne Murray won the 10,000m, with Vikki finishing fifth in 33.02.74. In 1995, Vikki McPherson regained her Scottish Women’s Cross Country title in February; and in May won the Women’s Home Countries International 10,000m road race in Kelvingrove Park. After several injuries, Vikki started to make a comeback by running for Britain in a 3000m at Gateshead in September 1997. The following year – 1998 – was very successful. In the UK Championships and World CC Trial, she won the silver medal, sharing the winning time with Liz Talbot (Yelling). Then in the World Championships in Marrakesh, Paula Radcliffe, Hayley Haining, Vikki McPherson and Liz Yelling won team bronze. Vikki improved her 3000m best to 9.21.2 and ran a very good 10,000m (32.38.42) in Lisbon in April 1998. Then she set a 5000m PB of 15.56.04. She became Scotland’s Commonwealth Games Team Captain and when the 10,000m took place in the steamy heat of Kuala Lumpur, Malaysia, Vikki finished a meritorious fourth.